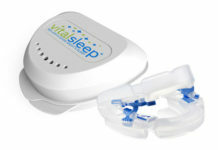 VitalSleep Review: Should You Have a Tonsillectomy to Correct Sleep Apnea? How Much Sleep Do I Need Per Day? We spend one third of our time sleeping and this is very important for human physical and mental health. Sleep quality and a person’s well-being depends not only on the overall sleep duration, but also on sleep stability and its phase composition. There are more than 80 sleep disorders. One of them is over here – Sleep Apnea. Sleep Apnea is most commonly diagnosed in people aged 30-60, more often in men than in women. The ratio of women to men is about 2% for women and 4% for men. Based on various epidemiological studies, it is indicated that sleep apnea can reach up to 10% of the population.According to US statistics, 12 to 18 million Americans suffer from sleep apnea. This prevalence almost equals the prevalence of asthma or diabetes. If you suffer from snoring or your relatives have noticed that your breathing stops for a short while during sleep, you feel sleepy and tired during the day, which may be signs of sleep apnea. There is no airway obstruction, but there is no respiratory flow. It occurs due to various disorders of the central nervous system (CNS), which results in the brain leaving no signal to the respiratory muscles – no breathing. The most common type of sleep apnea is Obstructive Sleep Apnea. Obstructive apnea occurs when in the event of severe muscle relaxation during sleep, the upper respiratory tract is pressed and the person can no longer inhale. Person tries to breathe, but the air can no longer get into the lungs. During apnea, oxygen decreases in the blood, cardiac activity decreases. Finally, the person starts to wake up to inhale. These awakens are very short (also called arousal), the person does not remember them, but they break down the structure of the sleep and prevents them from getting into deep, restorative sleep stages, sleeping becomes superficial. Sometimes breathing does not stops completely, but only becomes shallow, however this causes a decrease in blood oxygen. These breathing changes are called hypopneas. Central sleep apnea occurs when the brain does not send the signal to the body to breath. The airway is open, but with no breathing, the diaphragm simply does not pull air into the lungs. CSA affects about 10% of patients with sleep apnea, sometimes on its own, sometimes as mixed with obstructive sleep apnea. There are many reasons why CSA occurs. These are heart and circulatory system diseases, suffered stroke or other brain damage. People suffering from sleep apnea often wakes up from a deep sleep stages and enters into a light sleep stage, so they rarely spend enough time in deep, restorative sleep stage – it causes increased sleepiness during the day. This causes mood and behavioral problems, including depression, and this drowsiness triples the risk of accidents on the road or at work. Frequent fall in blood oxygen level causes headaches, reduces the ability to concentrate, think appropriately, learn and remember. Lack of oxygen and poor sleep quality stimulate the release of stress hormones. These hormones raise your blood pressure and heart rate and increase the risk of heart attack, stroke, heart rhythm and heart failure. Moreover, untreated sleep apnea may cause metabolic balance changes that increase the risk of obesity and diabetes. When you might suspect obstructive sleep apnea? Family doctor who suspects sleep apnea will send patient to a sleep clinic for a more detailed consultation. 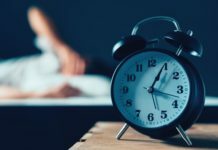 You will be asked how many hours you sleep per night, how often you wake up at night and how long such awakens last, how long it takes to fall asleep, whether you feel well rested in the morning and / or how much you feel sleepy during the day. Doctor will also ask if you have symptoms of sleep apnea such as loud snoring, snorting, morning headaches. These questions might need to be answered by your other half as well, because of some symptoms you might not be aware while sleeping. Will evaluate your anatomical data, i.e. height, weight, and such anatomical body features that may be the cause of complaints (such as short, large neck, short jaw, crooked nasal septum / broken nose), other features of the upper respiratory tract. Will ask you to fill out a few questionnaires, that will help you assess your mood, sleepiness during the day, habits and quality of life. 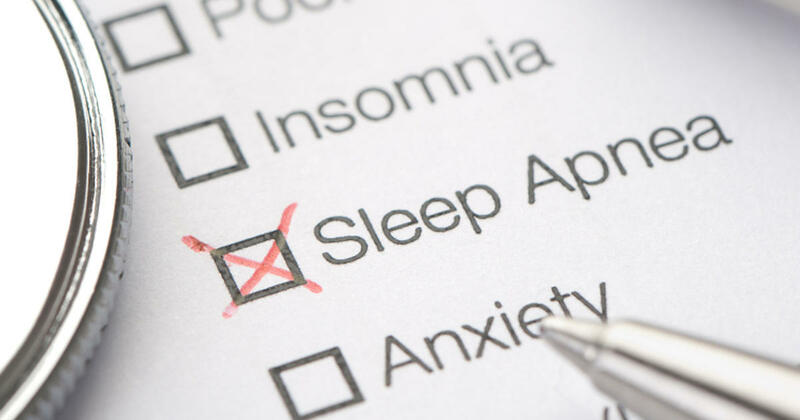 If sleep apnea or other sleep disorder is suspected, which requires a more detailed assessment, your doctor will appoint you a polysomnography test (sleep study). What might happen if sleep apnea is left untreated? Obstructive sleep apnea is not curable, the purpose of treatment is to eliminate or ease the symptoms and reduce possible complications. Increased sleepiness during the day, resulting in high accident rate or accidents at work. Obstructive sleep apnea may be due to overweight or obesity, especially for those who developed symptoms of sleep apnea after weight gain. In such patients, weight loss can be a very effective treatment, if not completely eliminating the disease, at least easing it. However, often due to apnea-induced fatigue and sleepiness, people find it difficult to exercise and move on, on the contrary, they try compensate lack of energy by eating more and drinking energy drinks. 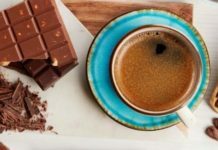 For these reasons, weight reduction should be used in combination with additional therapy. In some patients, apnea ours only when sleeping on the back, such an obstructive sleep apnea is called positional. For such patients’ postural therapy could be applied, where needed to sleep lying on the side. To apply positional therapy, you can sew a solid item (such as a tennis ball) on the back of your pajama or shirt, which prevents you from lying down on your back. It is also possible to use insoles / backpacks. Avoid asking your other half to rotate you while you sleep or monitor your sleeping position, let yourself and your family sleep peacefully. There is no effective medication for obstructive sleep apnea. Intensively advertised nasal sprays and stickers do not eliminate or even alleviate the symptoms of the disease. 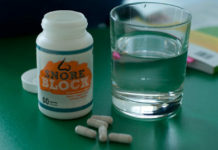 You should also be aware that some medicines cannot be used if you have obstructive sleep apnea. These are hypnotics, sedative, or other muscle (including upper respiratory tissue) relaxing preparations. They will only aggravate sleep apnea, breathing stops will become more frequent and longer. As a result, the amount of oxygen in the blood will drop to life-threatening levels, but the brain will “rest” due to the effects of the medicine and will not make you inhale. Remember, any medicine, including herbal remedies, may only be prescribed by your doctor. Oral correction devices are special devices that are placed in the mouth before going to bed. Their purpose is to bring the lower jaw and tongue forward, thereby increasing upper airway lumen tract and prevent swollen tissues. According to research data from foreign countries (especially Sweden), the correction of such devices can be effective if made individually according to the patient’s anatomy, but are often encountered with a number of complications, such as involuntary salivation, irreversible change in the bite, the jaw joint inflammation. Surgical treatment is used for the treatment of mild to moderate obstructive sleep apnea and only in exceptional cases of severe disease. 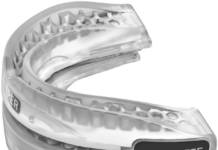 Treatment goal – to increase the upper airway tissue cavities and reduce problems associated with collapsed capability. Surgical treatment method selects the ear, nose and throat doctor or maxillofacial surgeon after extensive diagnostic tests. The obstruction is caused by partial or complete upper airway tissue sagging while sleeping, so the treatment is used which helps to reduce the obstruction or prevent its occurrence. Constant positive airway pressure (CPAP) is the most effective treatment for obstructive sleep apnea. CPAP machine generates a continuous positive pressure in the airways through a dedicated mask, which is attached to the head with fabric straps. CPAP machine uses ordinary compressed ambient air, blown through the nose or mouth. The air flow (or pressure) does not allow the airway to shrink during sleep, so the patient can breathe and sleep peacefully. The pressure is usually measured in centimeters in the water column (cmH2O) and can be from 4 to 20 cm H2O. The pressure should be sufficient to maintain the airway open, but not too large to irritate a sleeping patient. sufficient to maintain the airway open, but not too large to irritate a sleeping patient. Individual pressure is determined by the physician by performing continuous positive pressure titration. If CPAP therapy does not help patient to eliminate breathing pauses, normalize oxygen levels or other health problems arise, the doctor may choose another type of CPAP treatment or recommend another treatment. Remember CPAP ventilation is the mechanical opening of the airways with constant airflow. The treatment is only applied during sleep, the device works very quietly, so neither you nor your other half will be disturbed. On the contrary, although sleeping with a mask may seem unattractive or even reversible, this seems only at the beginning – the majority of people felt positive effect on the treatment very quickly. There are several types of CPAP machines to treat obstructive sleep apnea – CPAP, APAP and BiPAP (or Bi-LEVEL). All these machines operate under the CPAP principle. CPAP is the simplest treatment mode. Machine generates constant doctor prescribed therapeutic pressure overnight. Constant pressure means that the pressure level is unaffected by both inhalation and exhalation. If the patient has a high therapeutic pressure (> 10 cm H2O), expiration effort increases, which can lead to discomfort. For such cases, the CPAP FlexLINE mode can be used. 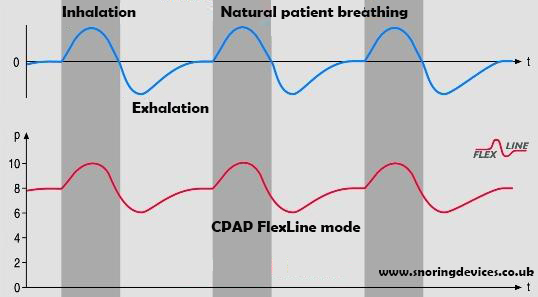 FlexLINE mode is very convenient in CPAP therapy. Thanks to special technologies, the device follows the patient’s natural breathing and replicates it. In proportion to the patient’s breathing, the pressure decreases when the patient exhales and increases when patient inhales, making the breathing more natural and pleasing due to a decrease in breathing effort (patient needs less strength to exhale). The pressure drop and rise are not fixed and may vary according to the patient’s need, as the machine replicates patient’s natural breathing. APAP (AUTO CPAP) is another type of CPAP machine for obstructive sleep apnea. 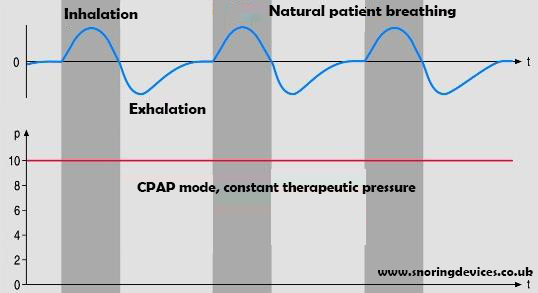 The main difference from the usual CPAP device is that the APAP machine, thanks to special complex algorithms automatically determines the therapeutic pressure, depending on the type of breathing pauses that occurs (obstructive, central, mixed) and intensity (apnea / hypopnea). When programming a machine, only the pressure limits are set- from the lowest to the highest possible therapeutic pressure. Within these limits (for example: 4 cmH2O – 15 cmH2O) the machine will vary overnight. If there are no breathing pauses in sleep phases, the pressure is reduced and the pressure is slightly increased on the first signs of apnea.The device recognizes obstructive sleep apnea, hypopnea, cases of central sleep apnea, snoring and natural breathing. Recognizing the type of breathing, the device automatically determines the appropriate pressure: increases pressure in case of obstruction and reduces pressure in the case of central sleep apnea or normal breathing. APAP also has the ability to accumulate and store patient nocturnal data, so the doctor can then see how much and what type of breathing pauses were during each night. 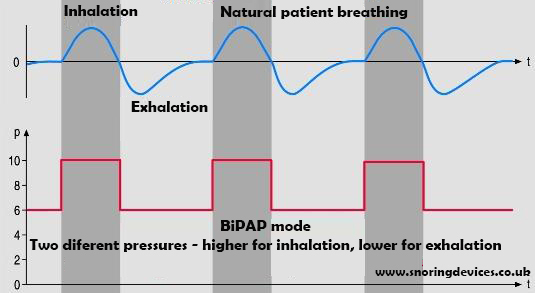 BiPAP (Bi-Level – two levels) differs from the standard CPAP, because it generates two different pressures for inhalation and exhalation. Both pressures are set in advance and are fixed. 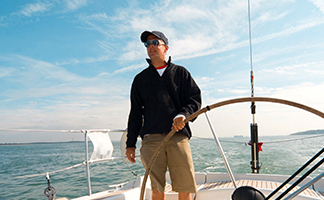 Inhalation requires higher pressure to prevent apnea, hypopnea or snoring. Exhaling requires less resistance to make you feel comfortable, and therefore the pressure will be lower than when inhaled. Bi-level devices come in several types: Bilevel S (Spontaneous) and Bilevel ST (Spontaneous and Timed). The standard CPAP masks are made of durable plastic with a soft silicone edge, which allows the mask to fit well and comfortably. Some masks are made of a special gel that changes shape and adapts to the lines of a person’s face. Usually all masks have adjustable strips with special stickers that can perfectly match the mask to the face. Adjust the strips in such a way that it is comfortable to sleep in all poses, do not tighten them too much, so that they do not press, but also not too loose, so the pressure does not blow into your eyes. Once you have adjusted the straps, you do not need to do this every time you use the mask. Sometimes conversations with other patients with apnea and CPAP users may be helpful. Perhaps you don’t know something or do not dare to ask? You can find many groups of sleep apnea, developed for this purpose portals and forums, where everyone can share experiences and get useful advice on one or another issue. Hi there, I’m George Sanders. I am here to help you to stop snoring. Being a snorer myself (diagnosed with mild sleep apnea), I've dedicated a lot of my time in the past 10 years to learn everything there's to know about snoring devices. Hi there, I’m GEORGE SANDERS. I was diagnosed with mild sleep apnea and set out on a journey to solve my snoring problem and help others do the same. Snoring Devices UK is a website focused on solutions for snoring, including all kinds of devices from mouthpieces, drops or snoring rings. We provide you with the latest information on the best products in the market so you can stop snoring in the quickest way possible. Can a Snoring Ring Help You Sleep Better?